This morning in Huntington at 6:25AM it’s currently 40 degrees and raining under overcast skies. Winds are out of the west at 4-8 mph. Relative humidity is 94%, dewpoint 38, barometric pressure 29.48” and falling rapidly. We picked up a dusting of snow overnight and 0.64” of rain. We have 1″ of snow on the ground. Yesterday’s high was 34, and the overnight low was 33. Morning radar imagery shows a long swath of rain hugging the Atlantic Coast from Florida up into the Canadian Maritimes. There is a Winter Weather Advisory still in effect for our region until 7:00AM this morning. The low pressure system and associated warm front moving up the eastern Seaboard today will bring widespread precipitation to the region today and tonight. We’ll see rain this morning, then rain or snow this afternoon as a cold front, now out over the Ohio River Valley moves across the region. Expect little or no snow accumulation during the day here. Highs will be in the upper 30s with south winds around 10 mph, becoming northwest this afternoon on the backside of the departing low. Chance of precipitation is near 100%. Rain will change to all snow tonight with total snow accumulations of 2″ to 4″ especially in upslope areas north. Lows will be around 15 with northwest winds 15 to 20 mph. Chance of snow is near 100%. Thanksgiving Day will be bring cloudy skies with scattered snow showers in the morning, then partly sunny skies with isolated snow showers in the afternoon. Highs will be around 19 with west winds 15 to 20 mph and gusting up to 30 mph. Chance of snow is 50%. Thursday night should be partly cloudy and cold with lows around 8 above and west winds 15 to 20 mph. Friday’s looking partly sunny and chilly with highs only around 19 and light and variable winds. Friday night should be mostly clear and cold with lows around 5 above. Last year on this date we had a high of 35 and a low of 22. We picked up 0.25″ of rain. Tomorrow will be 1m 41s shorter. The Moon is a waning crescent, 23d 22h old with 34% illumination. 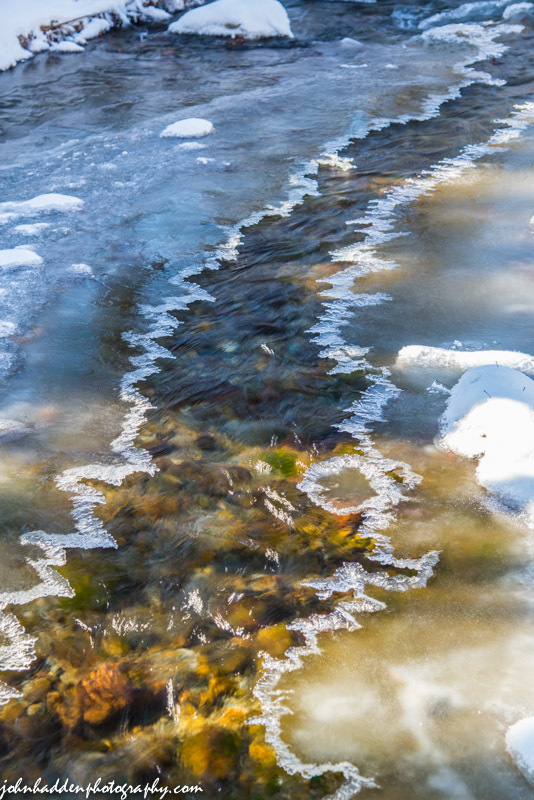 Anchor ice—building up on rocks in mid stream—seems to float in the flowing water of Fargo Brook. 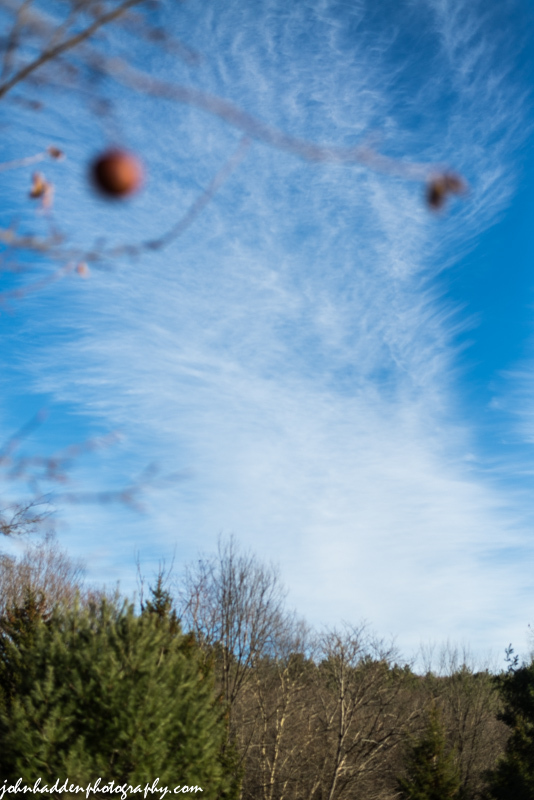 Nikon D600, Nikon 24-120mm lens @ 82mm, circular polarizing filter, ISO 100, f/11, 1/13″ exposure. This morning in Huntington at 6:25AM it’s currently 30 degrees under overcast skies. Winds are out of the south at 0-4 mph. Relative humidity is 66%, dewpoint 20, barometric pressure 30.18”. Snowpack is 1.75”. Yesterday’s high was 31 (at midnight), and the overnight low was 30. There is a Winter Weather Advisory in effect for our region from 5:00PM tonight to 7:00AM Wednesday. The powerful low that has been moving across the central US is poised to makes its way up the coast in the next 48 hours bringing a mixed bag of wintery precipitation to our region through Thursday. We’ll see a quiet day today with cloudy skies and a slight chance of snow later this afternoon. Highs will be in the mid 30s with south winds around 10 mph. Chance of snow is 20%. Tonight the low will track up into New Hampshire bringing rain until midnight, then rain, sleet, or snow after midnight. 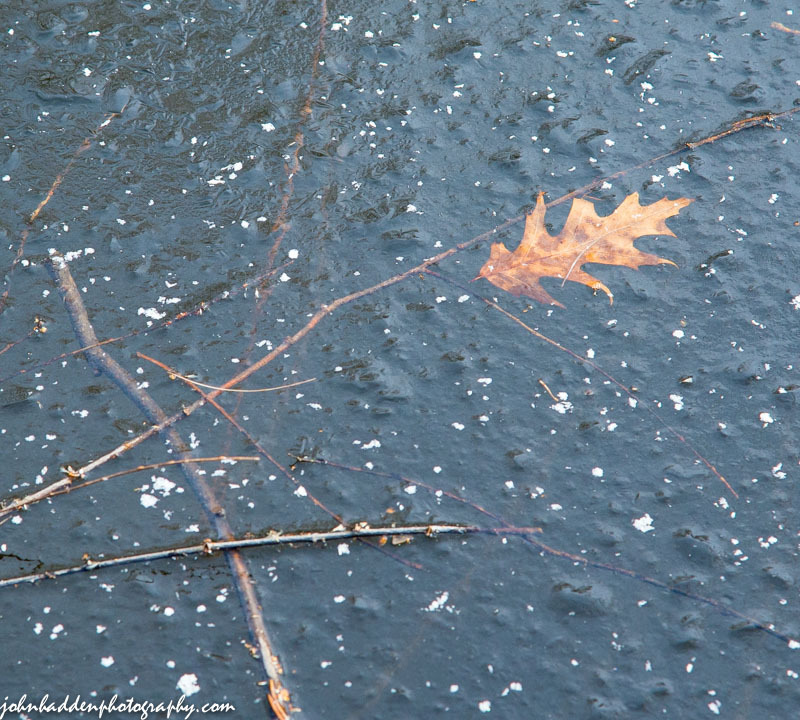 We can expect snow and sleet accumulations of a dusting to 2″ overnight. Lows will be in the lower 30s with southeast winds 15 to 20 mph gusting up to 30 mph. Chance of precipitation is near 100%. Overnight snows should transition to rain Wednesday during the day mixing snow or sleet in the afternoon. Expect additional snow and sleet accumulations of a dusting to 1″. Highs will be in the upper 30s with east winds 10 to 15 mph gusting up to 25 mph in the morning, then becoming light and variable. Chance of precipitation is near 100%. Precipitation should change back to snow Wednesday night as colder air moves in behind the departing low. There’s the possibility of light to moderate accumulations of 1-6″ depending on location and timing, with upslope areas in the Champlain Valley and east seeing higher totals. Overnight lows will be around 15 with west winds 10 to 15 mph gusting up to 30 mph. Chance of snow is near 100%. Lingering snow showers will continue into Thanksgiving Day before giving way to partly sunny skies and scattered snow showers. Highs will be around 19 with west winds around 15 mph and gusting up to 30 mph. Chance of snow is 50%. Thursday night should be partly cloudy and chilly with lows 5 to 10 above. This particular storm looks like it will dump the most snow out in the ‘Dacks with as much as 6-12″ possible in the mountains. Last year on this date we had a high of 32 and low of 19. The Moon is a waning crescent, 22d 22h old with 44% illumination. 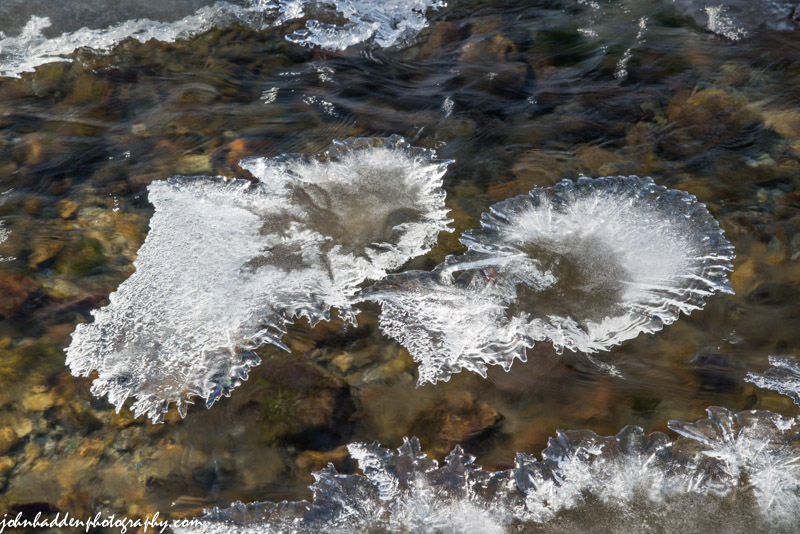 Yesterday’s frigid morning temperatures made for some lovely fringe ice on Fargo Brook. Nikon D600, Nikon 24-120mm lens @ 65mm, circular polarizing filter, ISO 100, f/6, 1/13″ exposure. 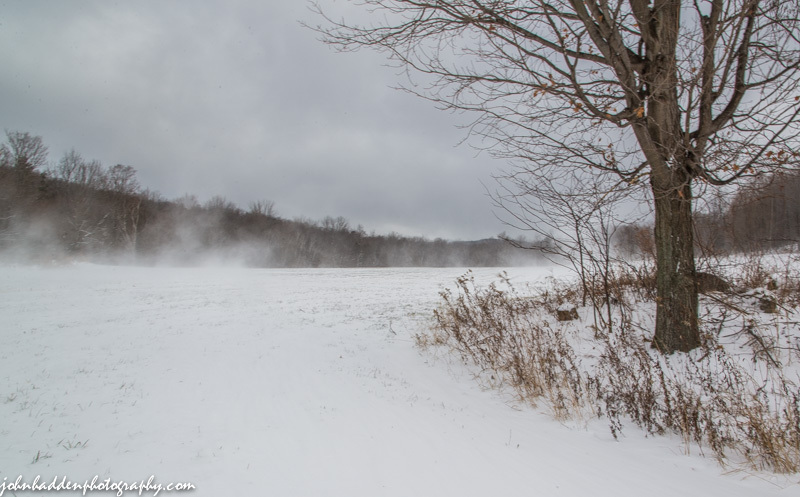 Gusting wind kick up new fallen snow across an upper hay meadow off Taft Road. This morning in Huntington at 6:40AM it’s a frigid 0 (zero) degrees under clear skies. One for the record books no doubt! Relative humidity is 88%, dewpoint -3, barometric pressure 30.39” and rising rapidly. Yesterday’s high was 20, and the overnight low was 0. Snowpack has settled to 2”. There is a Winter Storm Watch in effect for our region from Tuesday night to Wednesday night. A ridge of high pressure currently over the region is responsible for this morning’s clear and frigid conditions. We’ll see partly sunny skies during the early part of the day with highs recovering into the lower 20s on southwest winds at around 10 mph and gusting up to 25 mph this afternoon. A clipper system will move in later this afternoon brining clouds. Tonight will be mostly cloudy with a chance of snow showers mainly after midnight. Lows will be in the lower 20s with south winds 10 to 15 mph gusting up to 30 mph. Chance of snow is 30%. Tuesday should be cloudy with a chance of snow mainly in the morning. Highs will be in the mid 30s with south winds around 10 mph and gusting up to 25 mph in the morning. Chance of snow is 30%. A nor’easter will wind up the coast Tuesday night bringing rain transitioning to sleet or snow overnight with light snow accumulation possible. Lows will be in the lower 30s with southeast winds around 10 mph. Chance of precipitation is near 100%. Precipitation will continue into Wednesday bringing rain or freezing rain during the day. Highs will be in the mid 30s with north winds around 10 mph. Chance of precipitation is near 100%. Precipitation should transition back to snow Wednesday night with moderate snow accumulations of 1-3″ possible. Lows will be 15 to 20. Chance of snow is near 100%. The storm should push off the coast early Thanksgiving day with some additional accumulation possible in the morning. If traveling for the holiday, please plan accordingly and be safe! Last year on this date we had a high of 29 and low of 19. We picked up 0.10″ of rain. The Moon is in its last quarter, 21d 23h old with 53% illumination. With the new snow yesterday, I just had to get out on skis despite the cold and wind! A favorite hay meadow off of Taft Road offered enough pitch and just enough snow cover to make a few turns! Nikon D600, Nikon 24-120mm lens @ 24mm, ISO 200, f/22, 1/25″ exposure. This morning in Huntington at 8:00AM it’s currently a brisk 15 degrees under overcast skies. Winds are out of the southwest at 2-7 mph. Relative humidity is 78%, dewpoint 9, barometric pressure 29.98” and rising rapidly. We picked up 3.75” of snow overnight and have 3.75” on the ground. Yesterday’s high was 41, and the overnight low was 13. The is a Wind Advisory in effect from 7:00AM this morning to 10:00AM tonight Essex and Clinton counties of New York and the eastern half of Vermont. Our region will remain under a cold northwesterly flow for today and tonight as low pressure remains to our east and high pressure off to our west. We’ll see mostly cloudy with a 20% chance of snow showers today. It’ll be blustery and cold with highs only around 18 and northwest winds 15 to 25 mph gusting up to 45 mph. Tonight should be mostly cloudy until midnight, then clearing as the high moves our way. It will be frigid with lows around 3 above and northwest winds 15 to 20 mph gusting up to 40 mph, and diminishing to around 10 mph with gusts up to 30 mph after midnight. Monday should be mostly sunny in the morning, then become mostly cloudy with a chance of snow showers in the afternoon as another low approaches. Highs will be in the mid 20s with southwest winds around 10 mph. Chance of snow is 40%. Monday night should be cloudy with a 50% chance of snow showers and nearly steady temperature in the mid 20s with south winds around 10 mph. Tuesday’s looking cloudy with highs in the mid 30s and south winds 10 to 15 mph. Tuesday night snow is likely with light snow accumulation possible as a potential nor’easter winds up the coast. Forecasts at this point are not in agreement with the track of this storm or what form the precipitation will fall in, but if you’re traveling Wednesday, you be prepared for some sloppy weather. Overnight lows will be around 30. Chance of snow is 70%. Last year on this date we had a high of 44 and low of 27. We picked up 0.20″ of rain. Tomorrow will be 1m 51s shorter. The Moon is a waning crescent, 21 days old with 62% illumination. 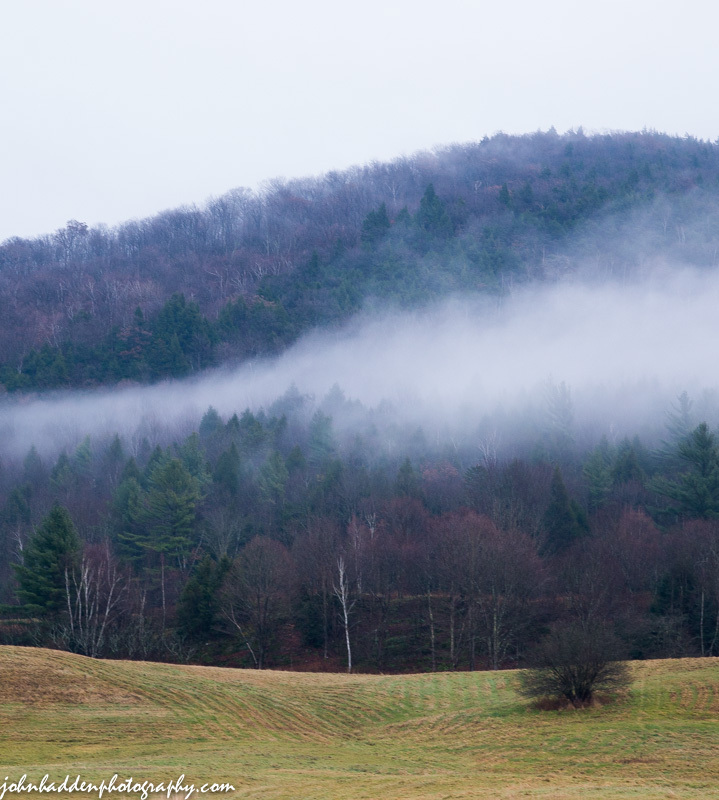 This shot of the hillside above the Towers Farm is from Friday when low clouds and fog stayed close to the ground throughout the day. A moody November day if ever there was! The scene will look a little whiter today! Nikon D600, Nikon 24-120mm lens @ 78mm, ISO 800, f/8, 1/80″ exposure. This morning in Huntington at 8:15AM it’s currently 29 degrees under mostly cloudy skies with some blue breaks to the west. Winds are out of the southwest at 0-4 mph. Relative humidity is 78%, dewpoint 23, barometric pressure 29.96″ and rising. We picked up 0.10″ of rain in the past 24hrs. Yesterday’s high was 41, and the overnight low was 29. A strong clipper cold front moving into the area today will produce snow squalls across northern New York in the afternoon hours and across central and southern Vermont this evening. Behind this front, unseasonably cold air will move down from Canada bringing frigid conditions on Sunday. We’ll see partly sunny skies this morning, then mostly cloudy skies with scattered snow showers this afternoon as the front move in. Highs will be around 30 with northwest winds 10 to 15 mph gusting up to 25 mph. Chance of snow is 50% with accumulations of a dusting to 1″ in valley locations with higher totals over the mountains and south. Tonight should be cloudy with scattered snow showers. Lows will be around 12 with northwest winds 15 to 20 mph gusting up to 35 mph. Chance of snow is 50% with another 1″ possible with higher amounts in higher northwest facing slopes of the Greens. Sunday should be mostly cloudy with a 40% chance of snow showers. It’ll be blustery and cold with highs only around 15 and northwest winds 20 to 25 mph gusting up to 40 mph. Sunday night should be partly cloudy and cold with lows around 6 above and northwest winds 20 to 25 mph gusting up to 35 mph. The front should move out by Monday bringing partly sunny skies and a southerly airflow that will help temperatures rebound a bit. Highs should be in the mid 20s with southwest winds around 10 mph. Monday night should be mostly cloudy with lows in the lower 20s. Last year on this date we had a high of 61 and a low of 34. Burlington norms for this date are highs of 42°F and lows of 29°F. Record high was 68°F in 1953. Record low was 2°F in 1972. Tomorrow will be 1m 53s shorter. Moon is waning gibbous, 20 days old with 71% illumination. There are still a few shriveling apples hanging in the trees of our front field. I suspect the deer will get to them before too long! 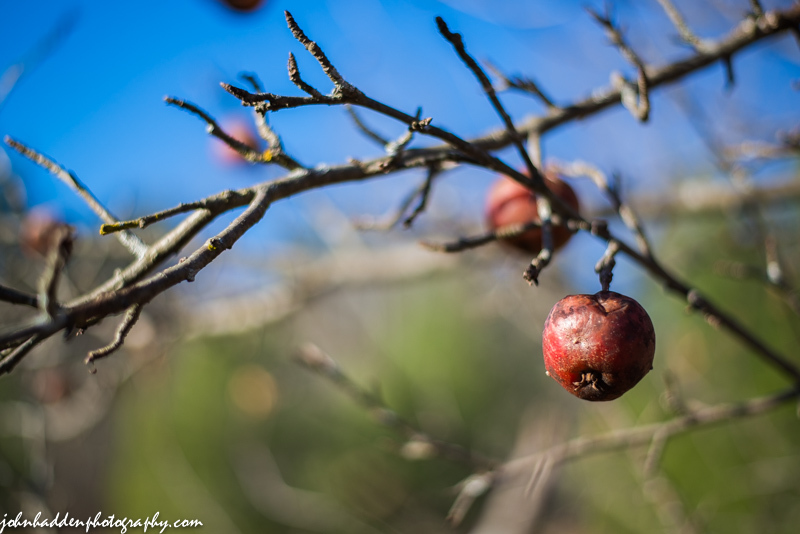 Nikon D600, Nikon 50mm lens, ISO 100, f/1.8, 1/1250″ exposure. This morning in Huntington at 6:30AM it’s currently 38 degrees and raining under overcast skies. Winds are calm. Relative humidity is 92%, dewpoint 36, barometric pressure 30.20” and falling. We’ve picked up 0.03” of rain. Yesterday’s high was 44 and the overnight low was 35. An area of low pressure and an associated warm front will lift through the region today followed by a cold front tonight. We’ll see cloudy skies with rain or snow showers likely, mainly this morning. Snow accumulation a dusting to 1″ are likely in higher elevations especially in the ‘Dacks and east of our immediate area. Highs will be in the lower 40s with light and variable winds. Chance of precipitation is 70%. Tonight snow or rain showers are likely until midnight, then snow showers are likely after midnight as the cold front moves through. Overnight snow accumulation of a dusting to 1″ are possible with higher totals in higher elevations. Lows will be in the mid 20s with southwest winds 10 to 15 mph, becoming northwesterly 15 to 20 mph and gusting up to 30 mph after midnight. Chance of precipitation is 70%. A brief ridge of high pressure will pass through the region Saturday morning bringing partly sunny skies with a slight chance of snow showers in the morning. A clipper systems will move through later in the day bringing mostly cloudy skies, much colder temperatures, and snow showers in the afternoon. Valley locations could see snow accumulation of 1-3″ while higher elevations could see 3-5″. Highs will be around 30 with northwest winds 10 to 15 mph gusting up to 30 mph. Chance of snow is 60%. Saturday night should be cloudy with a 50% chance of snow showers. It’ll be cold with lows around 11 and northwest winds 15 to 20 mph gusting up to 35 mph. Sunday’s looking mostly cloudy with a 40% chance of snow showers. It’ll be blustery and cold with highs only around 20 and northwest winds 15 to 25 mph gusting up to 40 mph. Sunday night should be partly cloudy and brisk with lows around 10 above. Last year on this date we had a high of 55 and a low of 25. Burlington norms for this date are highs of 43°F and lows of 29°F. Record high was 69°F in 1953. Record low was 3°F in 1969. Tomorrow will be 1m 57s shorter. The Moon is waning gibbous, 18d 23h old with 80% illumination. Nikon D600, Nikon 24-120mm lens @ 120mm, ISO 800, f/8, 1/160″ exposure. This morning in Huntington at 7:00AM it’s currently a brisk and frosty 15 degrees under clear skies. Wind are calm. Relative humidity is 93%, dewpoint 13, barometric pressure 30.58” and falling. Yesterday’s high was 35 and the overnight low was 15. Some changeable weather in the forecast for the next few days. We’ll see partly sunny skies today with highs in the upper 30s and light and variable winds, becoming southerly around 10 mph this afternoon. A cold front will move into the region tonight brining cloudy skies and a slight chance of snow showers after midnight. Lows will be in the mid 20s with light and variable winds. Chance of snow is 20%. Friday should bring a chance of snow showers in the morning, then cloudy skies with a chance of rain showers during daylight hours. Highs will be in the lower 40s with light and variable winds. Chance of precipitation is 50%. Friday night should be cloudy with a chance of snow or rain showers. Lows will be in the lower 20s with northwest winds 10 to 15 mph gusting up to 25 mph. Chance of precipitation is 50%. A brief period of high pressure will move through Saturday bringing partly sunny skies with a 30% chance of lingering snow showers. Highs will be in the lower 30s with northwest winds 10 to 15 mph. A clipper system should swing by to our north Saturday night bringing mostly cloudy skies with a 40% chance of snow showers. Lows will be 15 to 20. Last year on this date we had a high of 51 and a low of 26. Burlington norms for this date are highs of 43°F and lows of 30°F. Record high was 66°F in 1931. Record low was 1°F in 1933. Tomorrow will be 1m 59s shorter. The Moon is waning gibbous, 17d 23h old with 86% illumination. A solitary apple is limbed against fine cirrus clouds in yesterday’s blue sky. Nikon D600, Nikon 50mm lens, ISO 80, f/1.8, 1/4000″ exposure.